But how do they wear? The reason why I ask is I have found that I wear some of my home sewn clothes all the time and others not so much and it got me to thinking, Why? My trench coat I have worn quite a bit, especially with the rainy spring we’ve had here in NYC. And while I am still very proud of this coat, it is starting to look a bit bedraggled. Some of the hand sewn bits are pulling apart (totally my fault I guess). The fabric is not waterproof, so after that day I got stuck in the rain while shopping with Karen and Mario, I was soaked. And ever since then, there’s been this slight chemical smell coming off the coat. The buttonholes are becoming more raggedy in appearance with each wearing (guess I really should have interfaced the facings on the coat – lesson learned). The machine sewn seams however look great. The pockets are holding up beautifully, and I love my belt with my hand installed eyelets. And actually, my sister recently gave me the nicest compliment on this coat. We bumped into each other at the grocery store a couple of weeks back and I was wearing the coat. Later on, she asked me if that was the coat I had made because it had looked so professional and beautiful. She went on to say that when I had first finished the coat, she had only looked at the individual parts of the coat, not the sum total. And that, now that she’d seen it worn in out and about, she could see the overall effect and she loved it! Remember my Burda inverted pleat skirt which I raved about? While it still looks beautiful, I just don’t wear it that much anymore. And it’s not just because it’s Spring now and warmer out. Even though I used fusible interfacing, I think the waistband stretched out. So know the waist looks huge. It doesn’t help that I really only have one top to wear with it, a bulky sweater. So when I wear the outfit now, I feel and look thick in the middle. And Katie’s birthday dress did NOT make it through the wash ok. 😦 The delicate floral cotton voile was most delicate. The part where the straps are attached to the bodice front looked like the would just fray off. So, since the dress was a little big on her to begin with, I folded them down on the inside, sewed a few times back and forth and then hand sewed a heart-shaped abalone button on top of it. It looks super cute now and won’t come apart until Armageddon. I don’t have a picture of the repair, but let’s look at beautiful Katie, shall we? Thor’s shirt, despite being a cotton with lycra shirting, is even a delicate little flower with the addition of a fabric paint stencil. The care instructions listed on the paint say to not put it in the dryer. So air drying is the way to go. Fortunately, I told my sister that and she has been very faithful. The shirt is in excellent condition and it’s in heavy rotation as Thor loves it. Phew! So in answer to my own question, I think the most successful things I’ve made so far are my knit dresses. I will definitely be making more of them. I am not going to shy away from making more coats, because I learned a lot making my trench and know what I would do differently the next time. I think once I get back on the TNT search, I will be making a lot of things that will fill my closet with easy to wear items. Can’t wait!!! And so, I ask all of you now: How do your clothes wear? This entry was posted in Beginner, Question of the Day, Sewing. Bookmark the permalink. Personally, I find my handmade garments last longer than my store-bought ones. When you’re making it yourself, you can take the extra steps to reinforce seams, to use the best interfacing, and pick high quality fabrics because you’re only making one. I always pre-wash my fabric, so I know how it will react in the laundry. On the other hand, companies are looking for ways to cut costs, to use cheaper labour and construction techniques, and less expensive fabrics and trims, focusing more on the look of the garment in the stores and less on making it last. The care and effort I put into making my one special dress, is so much greater than the factory that just turned out 800 of the same item. Anyways, that’s just me.. I’m interested to hear what others think! I haven’t sewn in a long time so I don’t know how the prom and recital dresses I made you have held up. You tell me. As for the trench coat, have you tried scotch guarding it? I have also sent coats and jackets to the dry cleaners and asked them to waterproof them. It lasts a long time and I think it makes them hold up better. Give it a try once. You only have to dry clean and waterproof it once in a while. I would wash in cold water and delicate cycle the rest of the time. 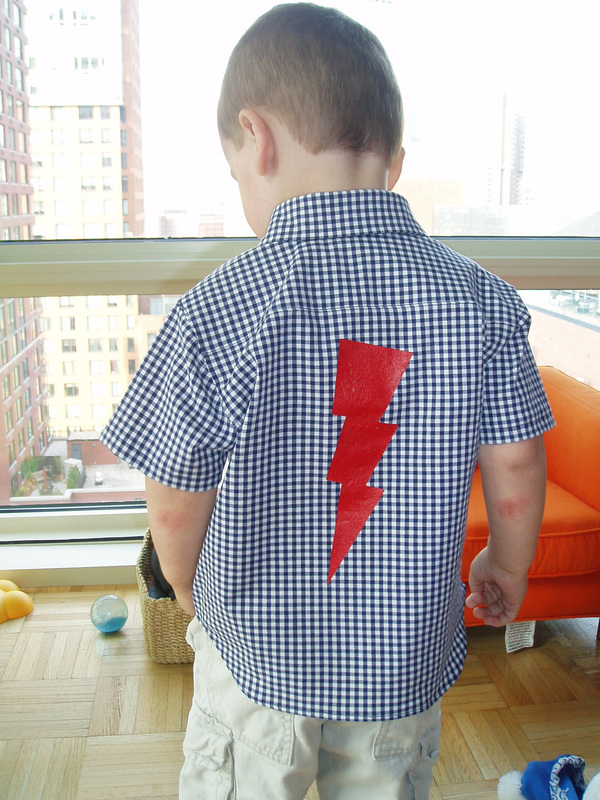 I make quite a few children’s clothes, and they generally get worn a lot and hold up well. Some of the appliqués get a bit frayed around the edges, but nothing serious so far. As for my clothes, a linen skirt I made grows during wear, but that’s what linen does. Funnily, the thing I have the most problems with is knits! I only have an old regular machine without “stretchy” stitches. I try to get by with a narrow zig zag stitch and stretching while sewing. Still, the seams sometimes “pop”. I guess I should sew the seams twice so I won’t have to repair so much! I find that the clothes I sew are my favourites over their off-the-rack cousins. What I make is custom-fit, wears better, and holds up over time. Plus NO ONE else has what I make. That unique quality is what makes sewing so delightful. I pre-wash my fabrics and make sure I interface all the parts that need it. What I’ve learned in sewing is that as you get better at it, you pick up little tips and tricks that make it go faster, hang better, feel right. It’s all part of the process. Do you have a serger? I’m in love with mine and find that when working with knits, it’s really ideal to make the finished product look more polished. PS: LOVE that your mom weighed in. SO cute. I haven’t been sewing so long, but so far my garments are holding up well. I agree that interfacing makes a difference – I have lots of storebought garments that have cheap interfacing that falls apart after a few washes. I worry about my hand-stitching too, but I’m pretty sure that if I could master a better beginning knot it would hold together better! I find the same thing, I end up wearing a few pieces over and over and over, while other ones hardly ever come out. When I like something I made, I wear it a lot. If I don’t like it so much, it eventually gets donated. 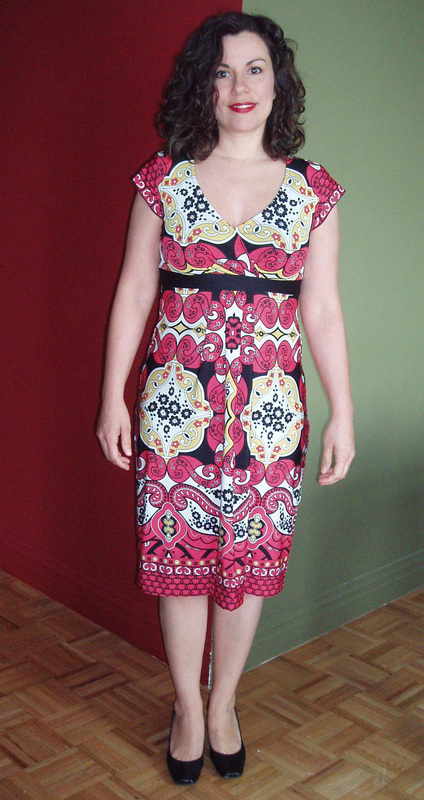 Please tell what patterns you used for the red border print dress and the purple rain dress … ? Like others, the garments I’ve made have held up well. 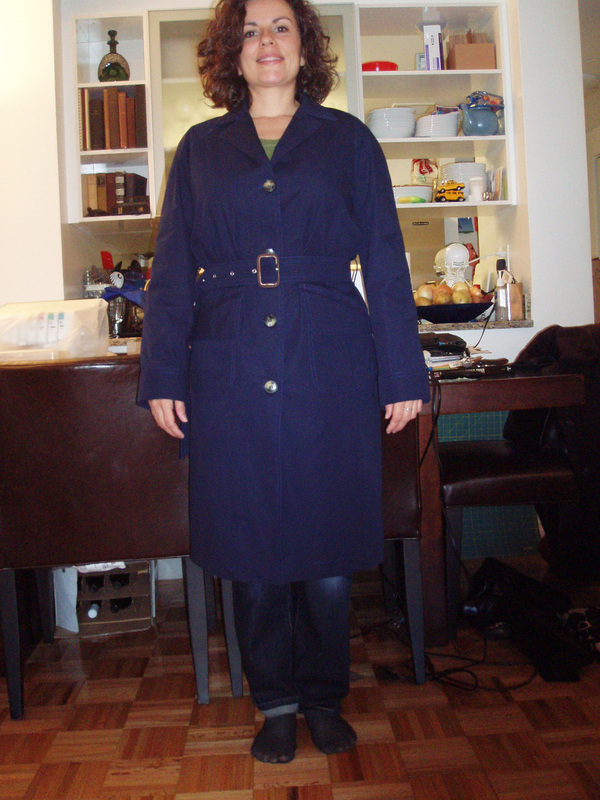 There is one garment that has not faired as well, actually a coat I made in Feb. 2009. The coat’s lining seams are showing signs of fatigue, probably due to using china silk, but for the most part is still wearable. A great question. I used to have a tally of the clothes I made in a side bar and ranked them according to success – but then I found success changed over time. Some did not survive the washing process well – others bagged out at the waist – like your skirt – and without belt loops became a nuisance. Others I didn’t have a great deal of enthusiasm for but over time there usefulness has earned them a place in my wardrobe and my heart. The more experienced I get as a sewer, the more I learn to accomodate the changes that happen to clothes as they are worn – for example I try to line everything now to help with fabric durability – I put belt loops on waistbands or tape them to stabilise – I am more inclined to make patterns twice that worked well on the first round etc. Elizabeth – I think well made clothing from home holds up just as well as store bought clothing. And I think you just found out something about what you like to wear…knit dresses…so make more of them…make lots of them and you will feel wonderful everytime you get dressed in the morning! I wear some of the things I’ve sewn regularly, others I don’t…some of them seem to hold up well (especially the more recent stuff) and some of them haven’t. Honestly, I haven’t noticed a difference in length of wear between my sewn garments and the RTW ones. But then, I’ve noticed that I pay a lot closer attention to the construction of my RTW garments now that I’ve been sewing for a while–I always wonder if someone buys one of those $300 dresses from D’s (rhymes with billiards) and is devastated when it comes apart after the first couple of wears. I love this post because this topic is a sore spot for me. I love the process of sewing but rarely wear the things I make? Not because they aren’t durable, they are. I think I have a mental glitch. But then again, I have no problems with RTW holding up. I only have a few labels I wear -Banana Republic, J Crew, Gap and Target t-shirts. But they hold up just fine over the years and then end up getting donated when I’m done with them. 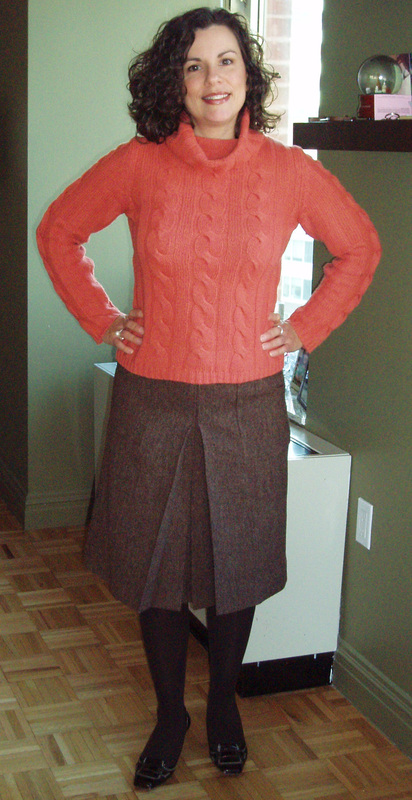 I also made the decision this spring to sew more of what I’ll wear – knits on top, pants on the bottom. We’ll see how it goes. There was a conversation like this on Pattern Review. Some people commented that they were embarrassed to admit they had made the clothes when others complimented them on these same clothes! I admit I have yet to wear anything I have made in my recent adventures into sewing. I publicly make a promise to you now that I will wear at least one item before the weekend it through. Cross my heart! I made a pair of jean last August and I’m embarrassed to admit I’ve worn these pants nearly every day since! The front pocket lining, which I made from flannel from an old duvet color, have holes and need repair, but otherwise they’re doing well. I avoid fusible interfacing because my sense is that it doesn’t hold up that well over time; most of the time it’s just as easy to use sew-in interfacing, or just another layer of fabric. If something is delicate I’d recommend washing by hand, just like any RTW item you want to take special care of. As you probably know, most of what I’ve sewn is knits – primarily dresses with a few tops thrown in. I’ve found that these items hold up *very* well and I love that I can wash them in the machine and throw them in the dryer or hang them to dry. No wrinkles, no shrinkage. The wovens – there are really only a few skirts (along with my coat, which I haven’t worn much) to talk about. These skirts haven’t held up so great but on the other hand, they were things I made before I really knew what I was doing so there are things I could have done to make them last longer that I didn’t. So the short answer is, I LOVE knits for their wearability, durability and travel-ability. Both of the two dresses you posted look fabulous – why not make more of those? I have been known to repeat the same patterns over and over – why mess with a good thing? I’ve found my home sewn clothing holds up at least comparably to my store bought stuff… my skirts and PJs have survived many many washes and still look like they did when i made them. The only part i’ve discovered that i’m not very good at and thus seems to wear out is the bottom of invisible zips, i don’t really know what i’m doing there and whatever i end up doing seems to fall apart after not long and i have to re-stitch it to cover the hole! I think it is great that you are analysing the wearability of your garments – because this is the way you constantly improve! You now know that fusing both the front panel and front facing around a buttonhole makes it last longer! And you now know that skirt waists need some sort of reinforcement! A waistband usually does this job well, but where there is no waistband you need to tape the waist to prevent it stretching – I use preshrunk 6mm cotton tape, and there is a tutorial on my blog if you want to see how I do it. If your fabric has slight stretch (eg wool suiting with 2% elastane) I sometimes use a lightweight knit fusing and apply it the ‘wrong’ way to the facing, ie perpendicular to the normal grain, in areas I don’t want to stretch. I did this in a recent high-waisted skirt – the firmer facing inside prevents the outer skirt stretching when I sit down! I adore your red print dress – I would wear it all the time too! I have found it depends on the fabric. I have a saying that the fabric will wear out before my stitches ever do. I have seen that proven true over and over. So for something you want to use for years and years – invest in good quality fabric. for seasonal and easy to remake items (like PJ’s) you can use the other stuff. Kattie you’re so full of cuteness. Adorable dress.